The worlds of fashion design and interior design are closely related, especially in terms of aesthetics. They follow similar trends and style ‘rules’. For quite some time, fashion rules firmly stated that purses, belts and shoes should always match. But in recent years, that rule has been bent to the point of being considered, what the cool-kids might call, “basic”. Nowadays, a statement shoe or pop of rose-gold are displays of style-courage, and indicative of an individual’s willingness to make bold moves with their attire. Likewise, the same conceptual rule-changes have occurred in the kitchen design world. The ‘purse/belt/shoes’ rule in fashion translates to ‘hardware/lighting/appliances’ in the kitchen design language. What we find now is that many homeowners are choosing to break the ‘hardware and fixtures must match’ rule and opting for multi-finish solutions instead. To Match or Not to Match Your Fixtures & Hardware? To clarify—it's not out-of-style to match hardware and lighting fixtures. Despite the aforementioned fluctuation in style-rules, it hasn’t gone so far that matching finishes is anywhere near faux-pas status. 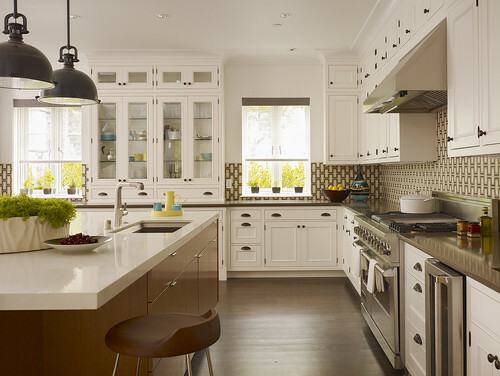 Here's a rule of thumb: matching fixtures is a safe and proven method for tidying up a kitchen design. The reality is that sometimes it's not even possible to match every fixture. And another reality? In a world where open floor plans have become the norm, there is way more visual input to consider. These circumstances have liberated us from some of the classic design rules that may have frowned upon some of our more creative ideas. Even though the rules have changed, they were in place for so long that steering away from them can feel like venturing into uncharted territory. There are still right and wrong ways to implement the blending of kitchen finishes. So, here are some helpful scenarios where mixing hardware and light fixture finishes can maintain a stylishly cohesive look. Let's say you've stumbled across a stunning overhead light fixture with a copper frame. Would you miss out on that showpiece because you had satin nickel or oil rubbed bronze hardware? Heck no! Install the fixture knowing the visual appeal it creates is far more of a bonus than a detriment. Farmhouse kitchens have the luxury of being designed using tenets of another era - when things were reused, re-purposed and recycled due to frugality rather than a focus on sustainability. Thus, farmhouse kitchens have traditionally been pretty eclectic. Spice racks were made from re-purposed pallets and open shelving was "built" using re-purposed fruit boxes. Farmhouse kitchens (or any eclectic kitchen design) can be confidently avant-garde when it comes to mismatched fixture and hardware finish selections. 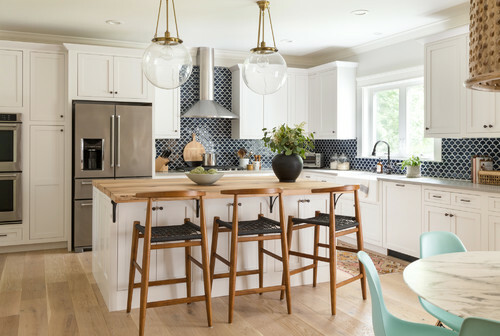 Many clients choose to mix-and-match cabinetry, perhaps a different finish on the uppers and lowers, or a different color for the kitchen island. When this is the case, some hardware finishes simply don't look at good against certain cabinet colors. 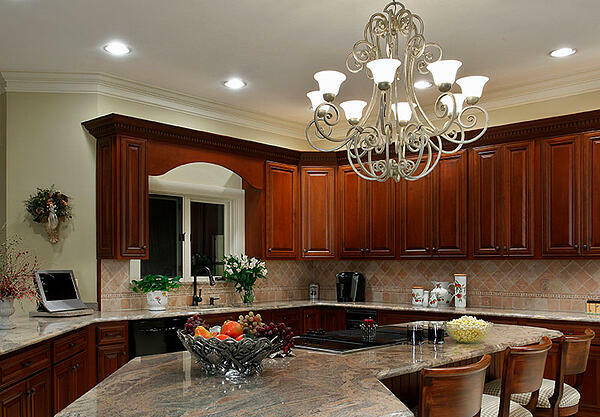 For example, oil rubbed bronze knobs and pulls can get lost against dark gray or navy cabinets. In cases like this, install oil rubbed hardware elsewhere and opt for brushed brass finishes against the darker cabinet background. Once there's a slight variation in hardware finishes, you are even more liberated in your lighting fixture choices. In some instances, it's all about transitions. 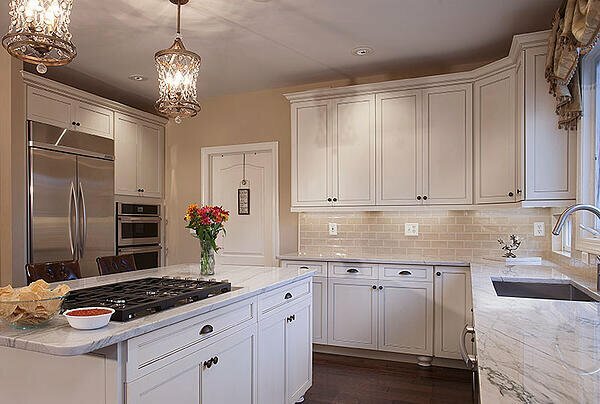 Just like a backsplash forms a transition between cabinets and countertops, you can find ways to use paint and other color enhancements to transition any differences between hardware and lighting fixture finishes. For instance, your gold or black accented light fixture will be fine if you have a countertop with black and/or gold accents. Then, your brushed nickel cup pulls will reflect some of those color accents as well—helping to transition the contrasts. This concept speaks to the Japanese aesthetic world-view known as wabi-sabi. It’s a trending design principle that finds beauty and order within imperfection. The idea is to creatively bring items together that would normally not be considered to match or coordinate. Designing with this concept will help you find individualized ways to mix up your kitchen finishes. You'll want to focus on "macro" and not "micro"
Designers can be their own worst enemies because they (and then their clients) become so fixated on each, individual decision that it begins to feel as if the world will end if a stainless-steel kitchen faucet is within reaching distance of a brass knob or pull. In fact, your kitchen design should always consider the "macro" viewpoint. Ask yourself—how will it all fit together as a whole? In almost every instance, the whole is more stylish than the sum of its parts. Work with Kitchen Magic to enjoy stress-free kitchen design with professionals who always keep the whole picture in mind. Our knowledgeable design consultants are well-equipped to navigate the terrain of mixing and matching kitchen finishes with finesse and style. 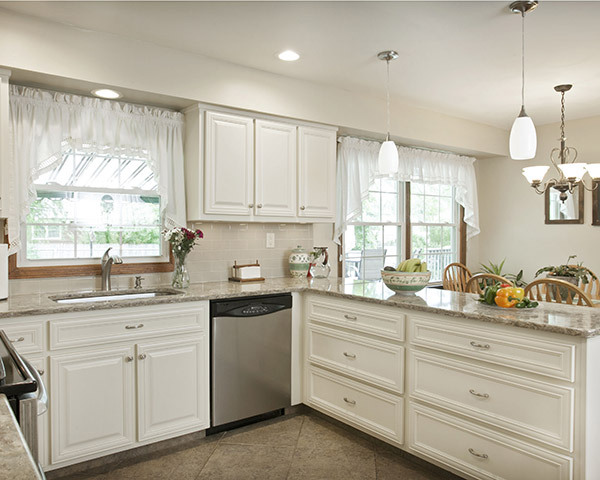 Schedule a free in-home consultation when you're ready to get the ball rolling on your kitchen remodel.